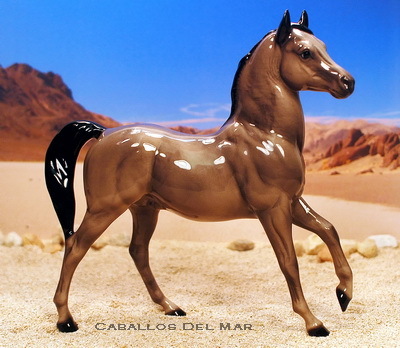 Note: In the early 1980s I attended Cal Poly Pomona, home of the famous Kellogg Arabians. I certainly appreciated the opportunity to see the continuing breeding program there - Reign On and Tu Fire were just two year olds when I started - and I had a special affection for one of the older stallions, *Wandal. He was an imported Polish Arabian, a Negatiw son, out of Warmia, which made *Wandal a half brother to US National Champion Mare, *Wizja. 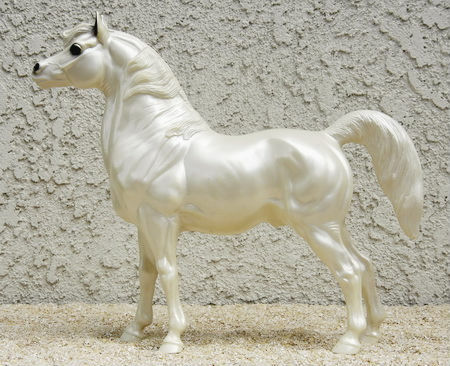 *Wandal sparked my interest in Polish bloodlines and with the wealth of Arabian horse information available in the Kellogg Arabian Horse Library, my model horse pedigrees became populated with real Polish Arabians. 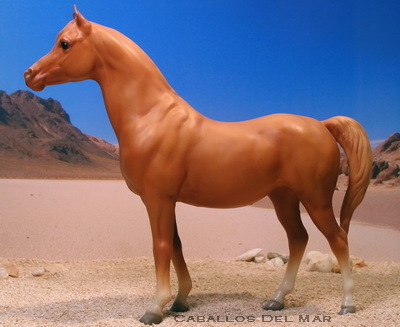 Today, our Arabian horses continue our original Polish and Polish-Russian breeding program. We encourage you to continue these lines in your own herd, and would be happy to assist you in finding an appropriate sire or dam for your foal. 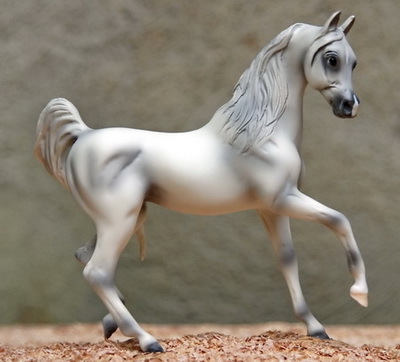 1991 grey Arabian stallion, Hartland 11" Arabian OF. So, two exceptions to our Polish program in a row: Constans is 7/8 Polish, with the 1/8 coming from the Gai-Adventure daughter Rani Charm. Beautiful pearl finish, Constans is a multi-Champion, IMEHA Superior Champion. 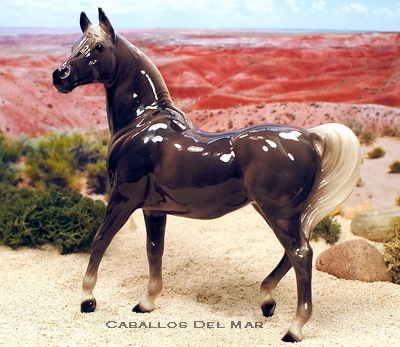 Owned by Laurie Jo Jensen, he stands here at Caballos Del Mar. 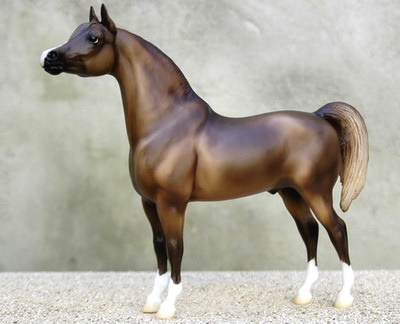 1993 chestnut Arabian stallion, Breyer SM G2 Rearing Arabian OF. Bred by Janow Podlaski, Ocenic was imported as a two-year-old. Classic Polish breeding with beautiful color and markings. Shown lightly, IMEHA Superior Champion, OFCC ROM. 1995 bay Arabian, HR DW “Ferseyn” SR o.f. glossy. A mostly Polish (with a bit of Russian) son of our multi champ stallion, Ambition, Conviction is one of the HR special run Ferseyns. He is a half-brother to our imported mare, *Chrys (see below). IMEHA Superior Champion, OFCC ROM. 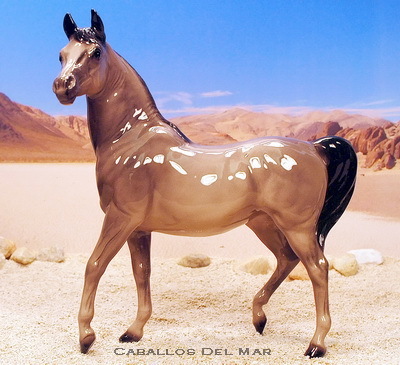 1995 bay Arabian, Breyer “Huckleberry Bey” Resin o.f. 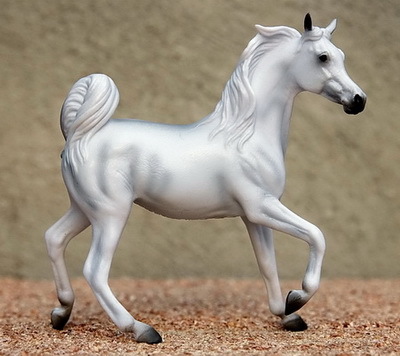 Appropriately named, Dekadent is the flashy Breyer Huck in cold cast resin. When this gorgeous boy came up for sale we knew he was coming home with us. Multi-Grand Champion, IMEHA Supreme Champion - Halter, Champion - Park/SS, OFCC Gold Medallion. 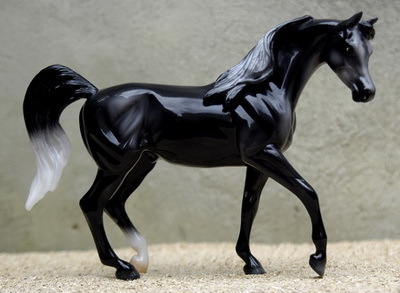 1996 grey (black) Arabian stallion, Breyer Onyx OF. Sired by Polish National Champion Stallion *Ecaho, Endemit is double Palas-bred, bringing a nice mix of old-Polish and Russian lines to anyone's pedigree. Shown lightly - Multi-Champion, IMEHA Superior Champion, OFCC LOM. 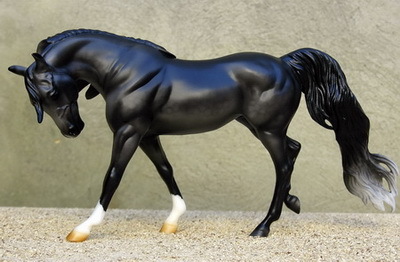 1996 bay Arabian stallion, Breyer FAS CM by Laurie Jensen. First created in the 1960's (! ), Laurie refreshed him many years later. Unshown to date. 1996 grey Arabian, HR DW “Abdullah” o.f. Imported from Janow Podlaski (Poland) as a two year-old, *Wilkon is an elegant, reserved stallion. Grand Champion, 2013 MEPSA Reserve Champion Arabian, IMEHA Premier Champion, OFCC Bronze Medallion. His daughter Elizja (see below) is on our show string. 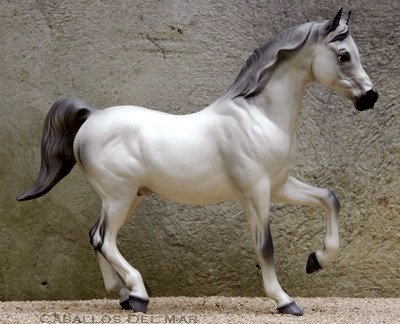 1998 grey Arabian, HR Mini Specialties “Arabian Stallion” o.f. glossy. A son of two of our showhorses, Reku has been shown lightly, IMEHA Champion, OFCC LOM. 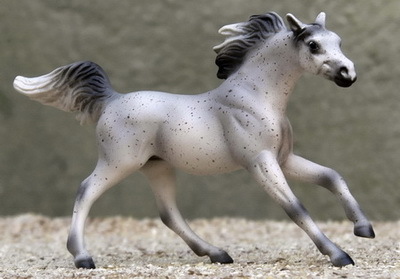 1998 grey (black) Arabian stallion, HR Mini Arabian Stallion OF. Mostly Polish, bred from Delana Melcalf's program, his name means "Secret" in Polish. Shown lightly, 2015 MEPSA Champion Light Type Stallion and Reserve HR Mini, IMEHA Superior Champion, OFCC Bronze Medallion. 2000 grey (chestnut) Arabian stallion, HR Abu Farwa OF. Another pure Polish stallion, Debate's pedigree is chock-full of National Champions and Top Tens. He is the old Abu Farwa model with hand-painted facial details and a 1955 factory name sticker. OFCC ROM. 2000 chestnut rabicano Arabian stallion, HR Large Amir CM by Sarah Minkiewicz. 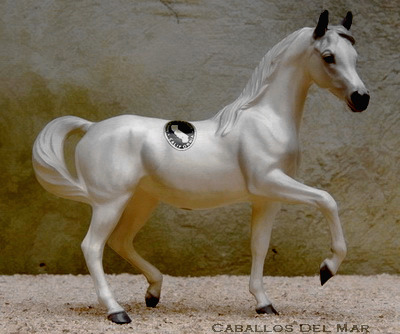 Absolutely stunning horse, with wonderful sabino markings and all of Sarah's trademark details. An exception to our Polish/Russian breeding program, he has terrific CMK breeding, with an emphasis on Abu Farwa and Kellogg-breds. His sire - grandson of the fabulous Poly Royal - is owned by Laurel Dedes/Persimmon Hill Farm, and his dam is out of a mare once owned by Cal Poly Pomona. 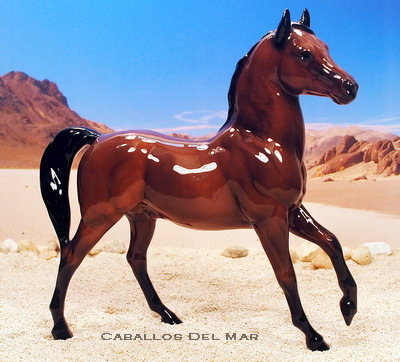 He was formerly owned by Laurie Jo Jensen, standing at Caballos Del Mar for several years until she agreed to sell him to us. Multi Grand Champion, multi-Champion, 2012 IPABRA Top Ten Sire and Arabian, IMEHA Superior Champion. 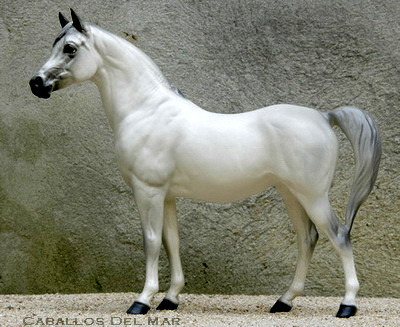 2000 grey Arabian, HR “Nataf” o.f. glossy. A magnificent horse, Nevsky brings together several great Russian bloodlines. He takes the place of his sire on our list. Nevsky has been a very successful member of our showstring - multi-Grand Champion, 2012 MEPSA Reserve Champion Arabian, 2012 IPABRA Top Ten Arabian, IMEHA Supreme Champion - Halter, Headstudy, Superior Event Award - Halter, OFCC Silver Medallion. 2000 grey Arabian, HR DW “Ferseyn” o.f. Palaver is a beautiful Monrovia model. He is pure Polish - his paternal grandsire was our multi champ showhorse in the 1980s, Ambition, and his dam, Perri, is out of the *Bask daughter, Perfik. Emelia, Palaver's filly out of Elitista (see below), is a multi Grand Champion. Multi-Champion, IMEHA Premier Champion, OFCC Bronze Medallion. 2000 grey Arabian, HR DW “Ferseyn” SR o.f. glossy. Pure Polish, Trezor is the dark grey Ferseyn SR. His sire, Solstice, is by *Salon, out of the imported *El Paso daughter, *Passionette. His dam, *Teoria, also produced our Grandorr daughter, *Technika (see below). IMEHA Superior Champion, OFCC ROM. 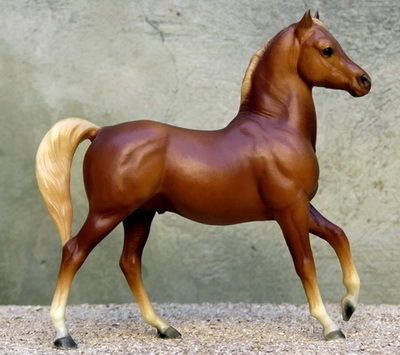 2001 chestnut Arabian stallion, Breyer CAS OF. A home-bred stallion by our imported Arbil son, and out of our multi-Grand Champion mare, Narcyza. Shown lightly, multi-Champion, IMEHA Superior Champion, OFCC LOM. 2002 grey (doeskin) Arabian stallion, HR Amir OF. Fascination takes the place of his sire on our list. Shown lightly, IMEHA Champion (as Declaration). 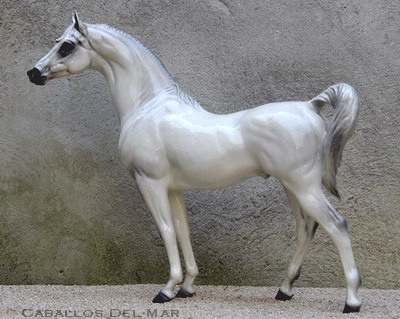 Calatrava(Gaudi x Ceruleana by Eukaliptus®) 2003 grey (bay) Arabian stallion, HR Large Amir OF. Bred by Laurel Dedes/Persimmon Hill Farm, Calatrava continues to build on our Polish breeding program. 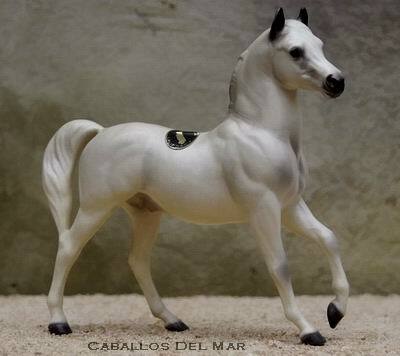 He takes the place of our terrific show horse, Gaudi, on our list. Multi-Grand Champion, multi-Champion, IMEHA Champion - Endurance, IMEHA Supreme Champion - Halter, OFCC Gold Medallion (as Gaudi). 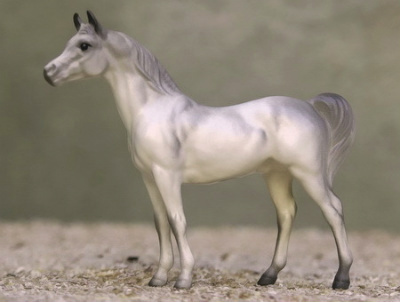 2003 rose grey Arabian stallion, HR Large Amir OF. Manitu takes the place of his sire on our list. Grand Champion, IMEHA Premier Champion, OFCC Bronze Medallion (as Pikolo). 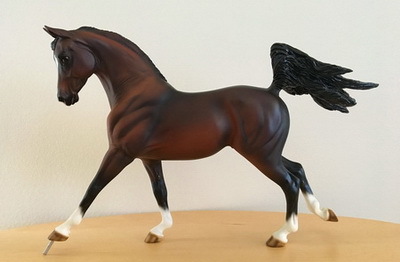 2005 bay Arabian stallion, Breyer FAS OF. 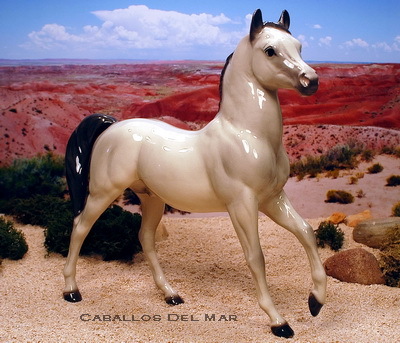 This was my very first model horse and he was and is well loved. He takes his sire's place on the list and his pedigree is a departure from our Polish breeding program. His grandsires are two of my favorite real horses: Khemosabi and Reign On. His paternal granddam is one of my foundation model Arabians, and his maternal great-granddam is the incomparable Sanibel, matriarch of the WK Kellogg herd. Unshown. 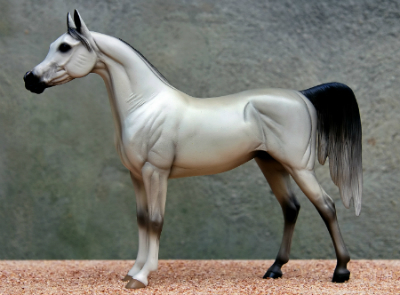 2005 grey Arabian stallion, HR Ferseyn OF. Shout combines the bloodlines of two of our favorite female lines - *Romantyka (dam of *Raket and our show mare, Rafia) and Sava (terrific showhorse and broodmare). He takes the place of his sire on our list. IMEHA Champion (as *Raket). 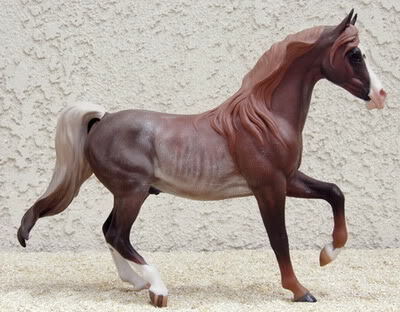 2006 chestnut Arabian, Breyer 2010 “PAS” LE o.f. 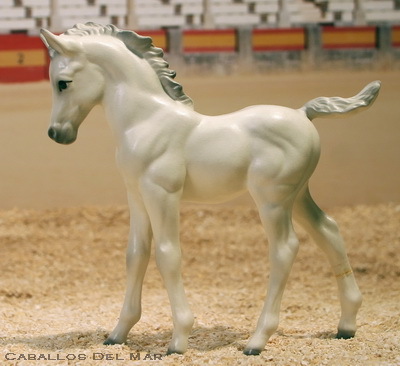 A product of our terrific show stallion Gaudi, and our lovely imported mare *Artemska (see below). 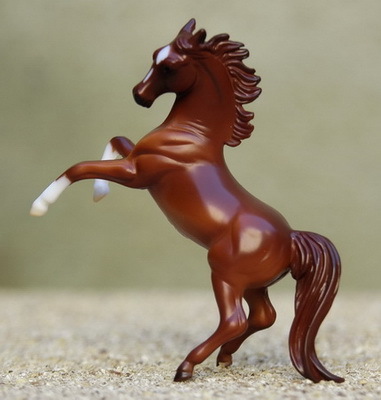 Antoni is a gorgeous shaded chestnut, pure Polish. Shown lightly to date - multi Reserve Champion, IMEHA Supreme Champion, OFCC LOM. 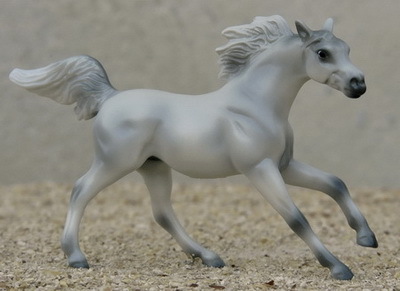 2007 grey Arabian stallion, HR Zilla OF. Pictured as a foal, Matisse has been shown lightly on our show string. Polish. Multi-champion, IMEHA Superior Champion, OFCC Bronze Medallion. 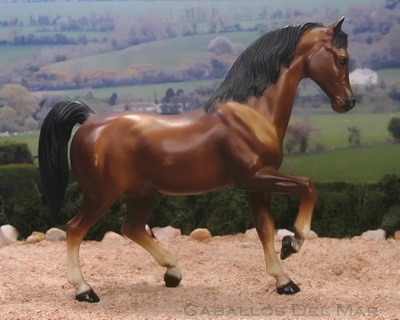 2007 chestnut sabino Arabian stallion, Breyer Ashquar OF. Samover is a multi-Grand Champion winner in the show ring, IMEHA Champion, OFCC SilverMedallion. 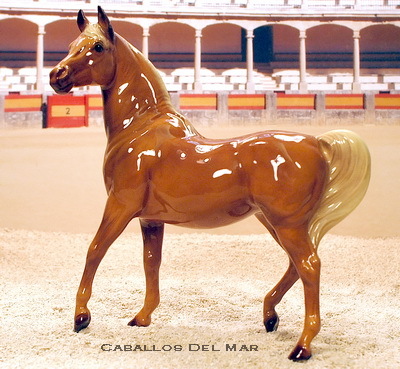 2007 bay Arabian stallion, H and H Winner's Circle Renaissance Resinry Amankhar Resin OF. 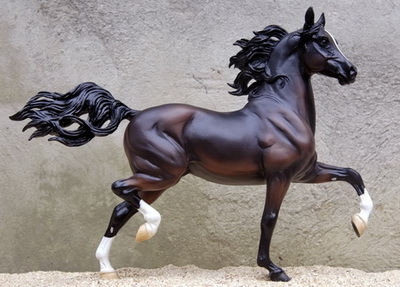 This gorgeous resin, created by Judy Renee Pope, has been on my bucket list forever. And now he's here. Terrific Polish pedigree to match his good looks. Imported from Poland as a three year old. Unshown to date. 2008 grey Arabian stallion, HR Sherif OF. Shown as a foal, Elekt is pure Polish, produced by two of our great showhorses, and has excelled in the ring himself: multi-champion, IMEHA Premier Champion, IPABRA Supreme Champion, 2013 MEPSA Reserve Champion Other Type Colt, 2012 MEPSA Champion Other Type Colt, Champion Arabian, Champion Light Breed, OFCC Gold Medallion. 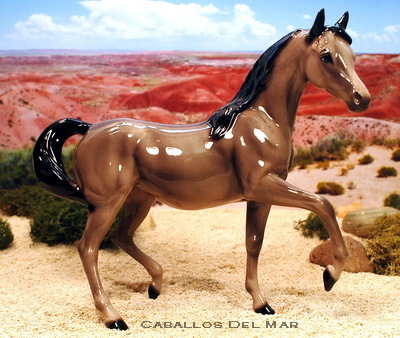 1995 grey (chestnut) Arabian mare, CollectA Arabian Mare OF. Bred by Twin Springs Stables, Empatia has great model-to-real bloodlines, including one of my old stallions way back in her pedigree. Shown lightly, Grand Champion, IMEHA Champion, OFCC LOM. 1997 grey Arabian mare, Sandicast Arabian OF. Gorgeous mare, daughter of our two great show horses, Gaudi and Rafia+++. Shown lightly, multi-Champion, IMEHA Champion, OFCC ROM. 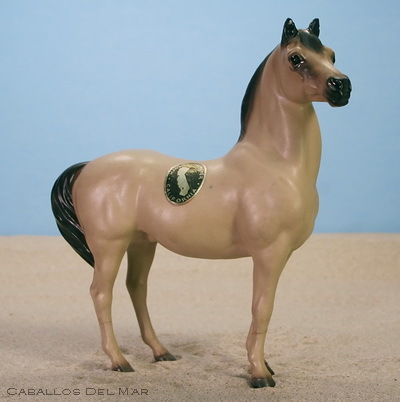 1997 chestnut Arabian mare, CollectA Arabian Mare OF. Lovely pure Polish mare out of our own Elitista, Ewelina is sired by our Grand Champion stallion, Pikolo. Just started showing and she has 4 Grand Championships under her...halter. IMEHA Superior Champion, OFCC LOM. 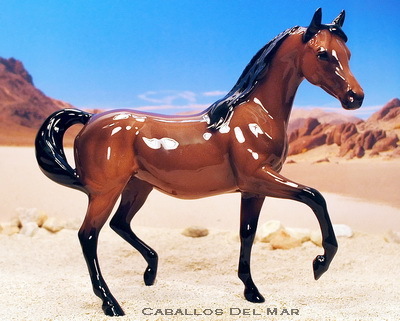 1998 dark chestnut Arabian mare, Breyer CAM OF. Beautiful and refined daughter of our great show mare, Elitista, and our exciting Park Champion, Dekadent. 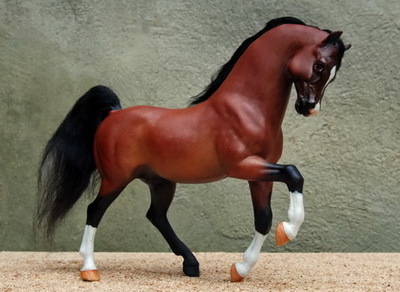 Multi-Grand Champion, 2015 MEPSA Grand Champion Gender, Light Type Mare and Breyer Classic (Division A), IMEHA Superior Champion, OFCC Bronze Medallion. 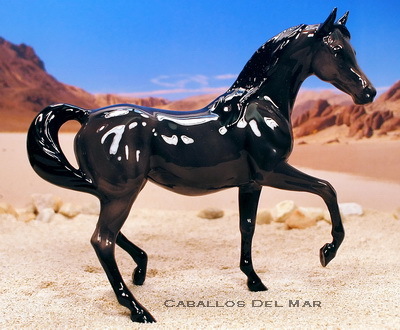 1998 grey (black) Arabian mare, Breyer "Make A Wish" OF. 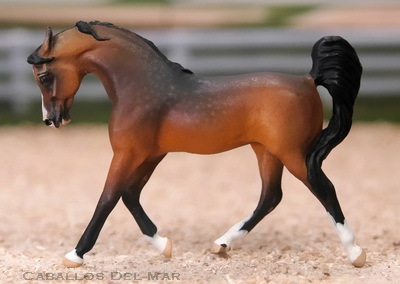 Sired by Polish and Dutch National Champion Stallion Pesal, Bermuda is the lovely JCP 2011 SR "Make a Wish". Pure Polish, shown lightly - Multi-Reserve Champion, IMEHA Supreme Champion, OFCC LOM. 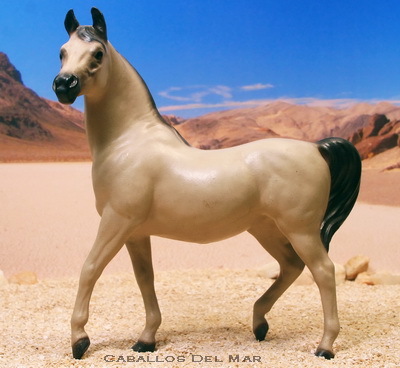 1999 grey Arabian, Breyer SM G4 "Endurance Horse" o.f. 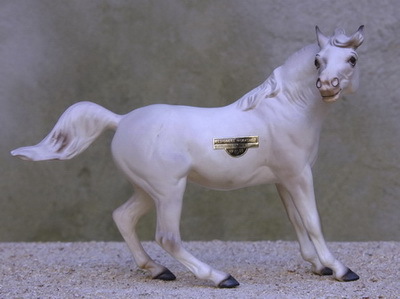 Bred by Heidi Reaves/Aspen Hill Arabians, Bukiet brings a great combination of pure Polish model and real bloodlines. Shown lightly, Grand Champion, IMEHA Superior Champion, OFCC LOM. 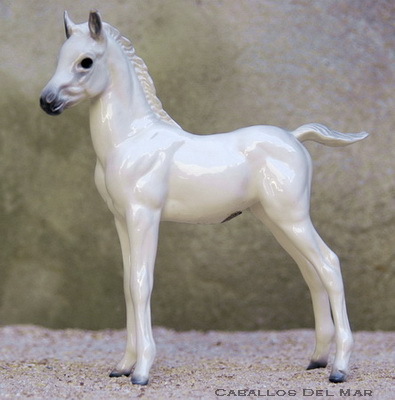 1999 grey Arabian, HR Mini "Arabian Mare" o.f. A daughter of our terrific mare Elitista, Elizja is a half-sister to our show mare Entaza (below) and our show foals Emelia and Elekt+. Sired by our imported stallion, *Wilkon, Elizja joined her siblings in the showring in 2008 and is a multi-Grand Champion, IMEHA Premier Champion - Halter, Champion - Headstudy, Superior Event Award - Halter, OFCC Bronze Medallion. 1999 rose grey Arabian, HR DW “Large Zara” o.f. Pure Polish. Suspensja is the beautiful San Marcos 1980’s re-release of this mold. She is sired by Regional Champion Poirot, a Negatraz son and out of our grand mare, Sava+. Multi Grand Champion, 2012/13 IPABRA Top Ten Arabian and Dam, IPABRA Supreme Champion, IMEHA Supreme Champion - Halter, Superior Champion - Headstudy, Superior Event Award winner - Halter, OFCC Gold Medallion (as Sava+). 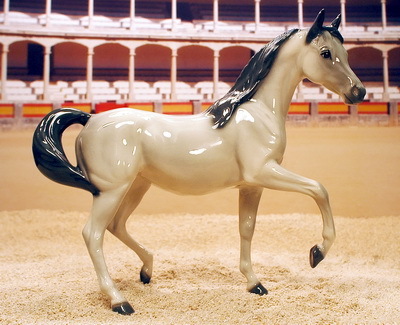 1999 grey (black) Arabian mare, Breyer Weather Girl OF. 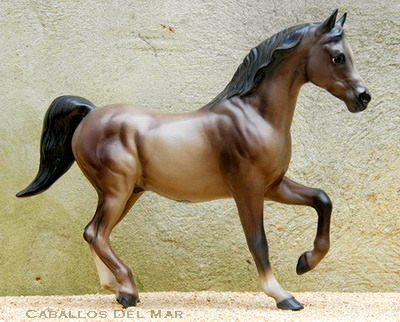 Sired by Polish National Champion Stallion *Wojslaw, who in turn sired Polish and US National Champion Stallion *Emanor. Shown very lightly, Multi-champion, IMEHA Supreme Champion, OFCC Silver Medallion. 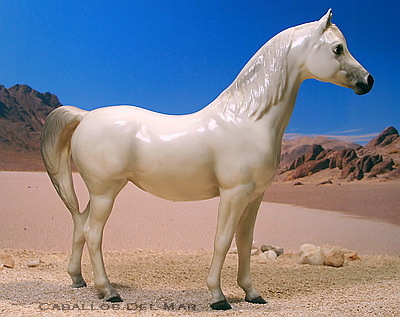 2000 grey Arabian, HR DW “Sheba” SR o.f. glossy. It's all about "girl power" in *Bandyta's pedigree. Her sire, Pamir, is a son of Probat out of the great broodmare, Parma, who produced 21 foals for Janow Podlaski, including Partner, Parys and Polonez. On her dam's side, she is a great-great-granddaughter of the "Queen of Poland" herself, Bandola. *Bandyta was imported in 2004 and we look forward to many, many foals in her future. 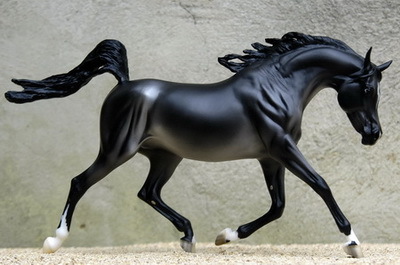 2000 black Arabian, HR DW “Sheba” SR o.f. glossy. 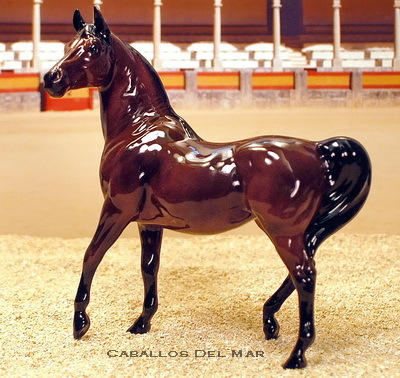 A beautiful daughter of the magnificent black stallion Opus One, Calafia's pedigree is a wonderful combination of second and third-generation Polish Arabian breeding in the U.S. Lightly shown to date, Multi-Champion, IMEHA Superior Champion, OFCC Bronze Medallion. 2001 grey (doeskin) Arabian mare, HR Zara OF. Our second Opus One daughter, Mandolyn C takes the place of her dam on our list. Shown lightly, IMEHA Champion, OFCC ROM (as *Mandatka). 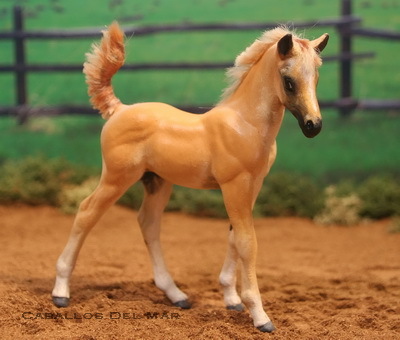 2001 bay Arabian mare, HR Mini Arabian Mare OF. Beautiful Russian-bred mare, Narena takes the place of her dam, Natalya, on our list. Half sister to our show stallion, Nevsky. Shown lightly, multi-Reserve Champion, OFCC ROM. 2001 light chestnut Arabian mare, HR Zara OF. Pure Polish, out of our model-to-real bred mare Novation (see below), sired by US and Polish National Champion Stallion, *Emanor. Shown lightly, IMEHA Champion (as Novation). 2003 bay Arabian mare, HR Zara OF. Circa is sired by Polish National Champion/US Reserve National Champion Stallion *Ganges, and takes the place of her dam on our list. Champion in limited showing (as *Chrys). 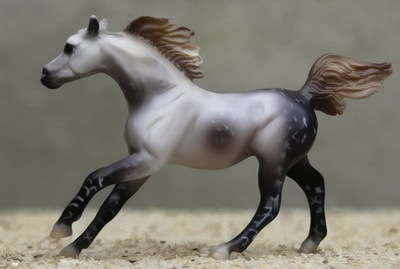 2003 bay Arabian, Bogucki “Tifla” resin painted by Laurie Jensen. "Taz" is an exciting young mare, sired by the impressive *Europejczyk son, WA Pejczyk, out of our super Strike daughter, Elitista. Taz has come home with multiple Grand and Reserve Grand Championships, 2012 IPABRA Top Ten Arabian, 2012 MEPSA Reserve Champion AR Mini, IMEHA Supreme Champion, Superior Event - Halter, Register of Merit and Supreme Champion Awards. 2003 grey Arabian mare, HR Sheba OF. Bred by SO Bialka in Poland, *Konfesia was imported in utero. She takes the place of her dam on this list. Shown lightly, Reserve Champion (as *Kolejka). 2003 grey Arabian mare, HR Large Zara OF. Realista is the beautiful Monrovia Large Zara with exquisite detail and shading. Multi Grand Champ, over 300 Champion/Reserve titles. 3x IPABRA Supreme Champion (Halter and Bloodstock), 2014 and 2015 MEPSA Division B Horse of the Year, 2015 MEPSA Reserve Grand Champion Gender (Division B), IMEHA Paragon Champion, OFCC Foundation Champion (retired) (as Rafia+++). 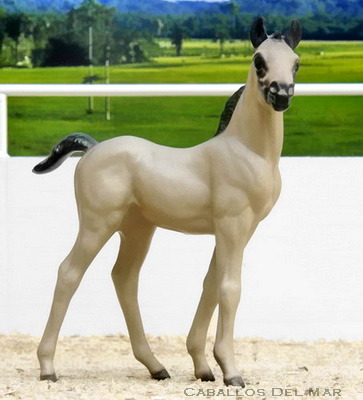 2003 grey (black) Arabian mare, Breyer Breeds of the World Arabian Resin OF. Sired by Me-Dow Stables' great stallion, Firewall, and out of our lovely showmare, Zalewa, Zapora brings some excellent new Polish bloodlines to our program, both model and real. 2015 MEPSA Grand Champion Gender and OF Manufacturer (Mini), Champion Light Type Mare, Arabian, Light Breed and OF Resin, IMEHA Superior Champion, OFCC LOM. 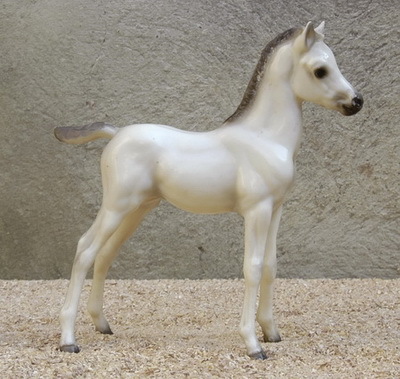 2004 grey Arabian mare, Breyer PAM OF. Granica takes the place of our beautiful and popular broodmare, Gozymer+, on the list. Her sire is Polish/Russian-bred. One of the 14 OF Breyers retained from our original collection, Multi-champion, 2011/12/13 IPABRA Top Ten Dam, IPABRA Supreme Champion, IMEHA Paragon Champion, OFCC Silver Medallion (as Gozymer+). 2005 chestnut (flaxen) Arabian mare, HR Zara OF. Imported in utero from Poland, Arywista is sired by the Polish National Champion Stallion Emigrant, and now takes her dam's place on our list. Multi-champ, IMEHA Superior Champion - Halter and Champion - Headstudy, OFCC LOM (as *Artemska). 2006 grey Arabian mare, HR Sheba OF. Sired by the great Polish National Champion Stallion, *Ecaho, this pretty mare takes theplace of her award-winning dam on our list. IMEHA Supreme Champion, OFCC Silver Medallion (as Elitista). 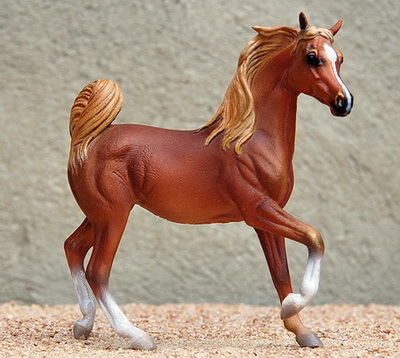 2006 chestnut Arabian mare, Breyer PAM OF. One of the few o.f. 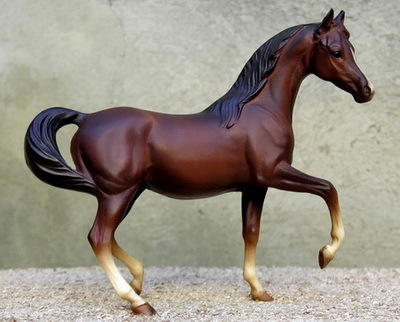 Breyers we retained for our original collection, Nuance is the 1985 Model Horse Congress Special Run of only 250 models. Multi-Grand Champion, multi-champion, IMEHA Supreme Champion, OFCC Bronze Medallion (as Narcyza). 2006 fleabitten grey (bay) Arabian mare, Breyer SM G4 WEG Endurance Horse OF. Razowka is from one of the last foal crops of Polish National Champion *Wojslaw, and out of our lovely show mare, Rafia+++. IMEHA Supreme Champion, OFCC LOM. 2006 grey (bay) Arabian mare, HR Zara OF. Sired by our Cartier son, Kalvn, Terkota takes the place of her dam on our list. IMEHA Superior Champion, OFCC ROM (as *Technika). 2007 grey (bay) Arabian mare, HR Zara OF. 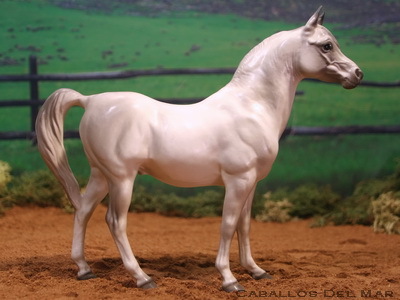 Sired by Polish and Dutch National Champion *Piaff during his lease in the US, Dammera takes the place of her dam, a third generation-bred CDM Arabian. Multi-Reserve Grand Champion, IMEHA Superior Champion, OFCC ROM (as Dekoracja). 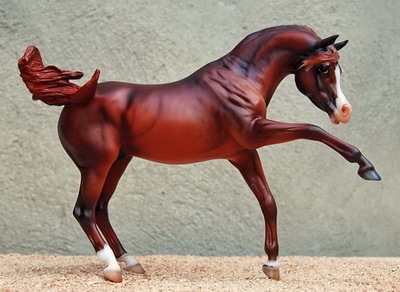 2007 chestnut Arabian mare, Breyer CAF CM by Laurie Jo Jensen. Pictured as a foal, Emelia has been a Champion since Day One - her first show. Since then she has picked up multiple Championships and Grand Championships, 2012 IPABRA Top Ten Arabian, IMEHA Premier Champion, and Superior Event Halter titles. 2007 bay Arabian mare, HR Sheba OF. Sired by three-time US National Champion Park Horse, MHR Nobility, Pekala takes her dam's place on our list. Shown lightly, IMEHA Superior Champion, OFCC LOM (as Perri). 2007 grey Arabian mare, HR Large Zilla OF. 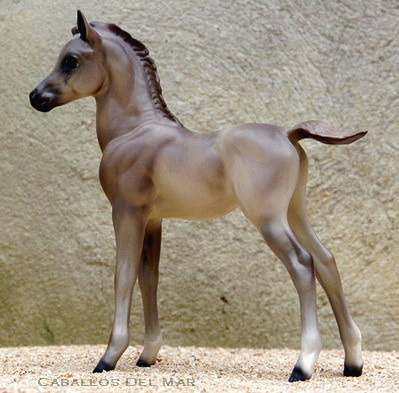 Shown as a foal, Raffina is a beautiful young mare out of our grand showhorse, Rafia+++. 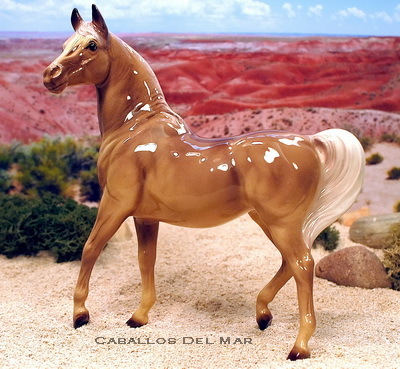 Multiple Grand Champion winner and IMEHA Supreme Champion, 2012 MEPSA Champion Other Type Filly, OFCC Bronze Medallion. 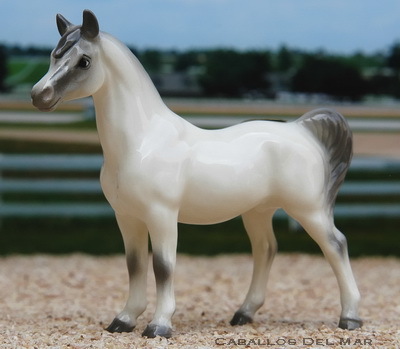 2007 rose grey (bay) Arabian mare, Breyer SM G4 Endurance Horse OF. Saski's sire is a wonderful Polish-bred stallion owned by Indigo Creek Stables; she takes the place of her dam on our list. Shown lightly, multi-champion, IMEHA Champion (as Sarisa). 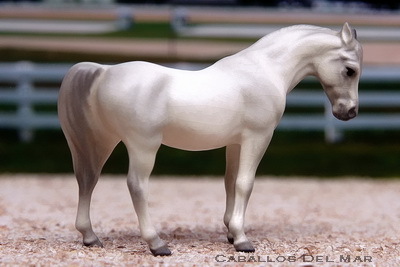 2008 grey Arabian mare, Breyer PAF OF. 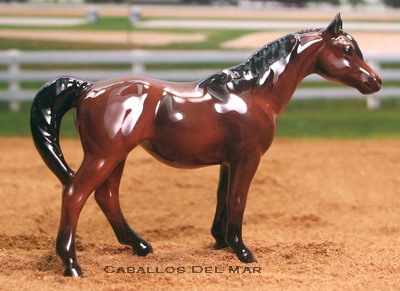 Pictured as a foal, Galiarda was one of the few OF Breyers we retained from our original collection. Multi-Champion, IMEHA Supreme Champion, OFCC Silver Medallion. 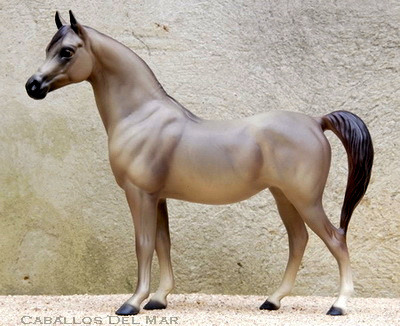 2008 rose grey Arabian mare, HR San Marcos Large Zilla OF. Shown as a foal, Sabine+ is one of our superstars - in addition to her terrific Polish pedigree, she is a multi-Grand Champion, 2013 MEPSA Champion Other Type Filly, IPABRA Supreme Champion and 2012 and 2013 Top Ten Arabian, IMEHA Supreme Champion and Superior Event - Halter winner, OFCC Diamond Champion. 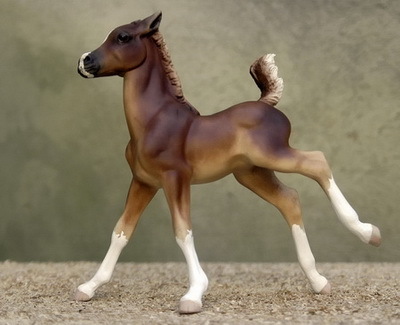 2011 chestnut Arabian mare (shown as a foal), Hartland Jade CM by Heather Kapica. This frisky girl brings together two of our favorite Arabians, and is a departure from our pure Polish program. Her sire is Laurie Jensen's Kellogg-bred SMB CM HR Amir and her dam is our lovely Rafia. IMEHA Supreme Champion.